(MENAFN - Colombo Gazette) Notre Dame caught fire, with the flames engulfing the upper part of the cathedral and causing the spire to collapse. A major operation was under way, the fire department added, while a city hall spokesman said on Twitter that the area was being cleared. Two hours after the fire began, the spire of the cathedral collapsed in flames. Fire trucks sped through Paris towards the scene on the Ile de la Cite - an island in the Seine at the heart of Paris. 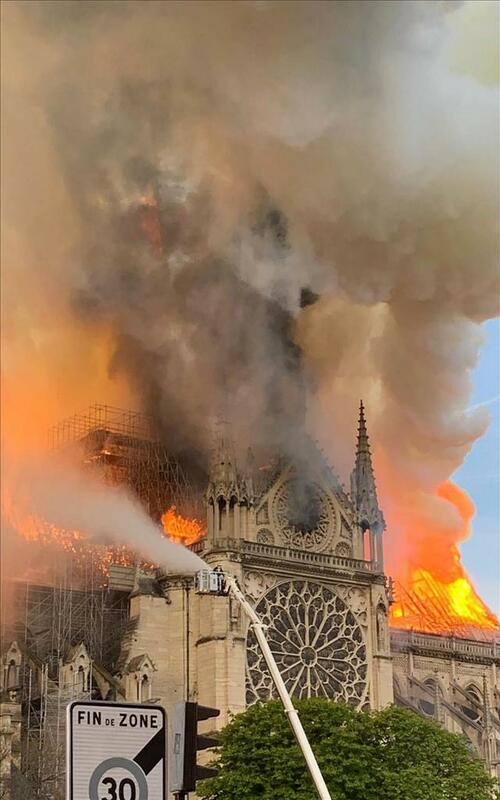 Officials in Paris said the fire, which started around 7pm local time, could be linked to renovation works being carried out at the cathedral. French media reports, citing police sources, added that the fire started by accident. Emmanuel Macron, the French president, announced he was cancelling a speech he was due to give this evening due to the conflagration. "The smoke is blowing over the south side of the city towards the Tour Eiffel," eyewitness Anne-Sophie Faivre, a 21-year-old Warwick University student on her year abroad in Paris, told the Telegraph. "You can't quite smell the smoke but it's definitely in the air and the doesn't seem to be any let-up in it coming from the cathedral. "As you can imagine there are a lot of people both tourists and locals who have gathered to watch." It comes after France's Saint Sulpice church , used in the filming of Dan Brown's 'Da Vinci Code' thriller, caught fire in March.